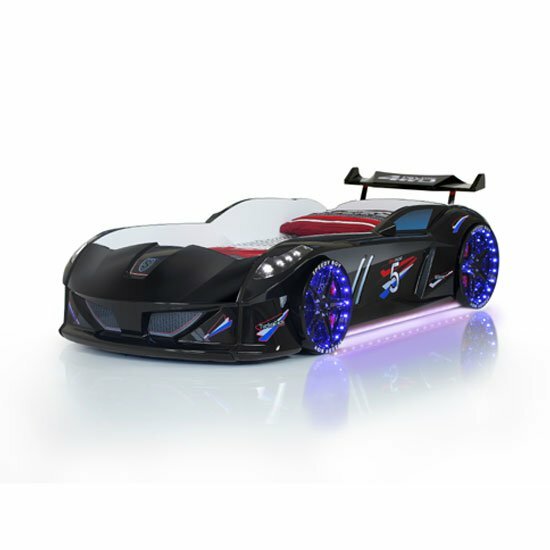 If you think of going with a car bed for your boy’s room, you should pay especial attention to car beds with headlights. These stylish models are widely available in stores these days, and they offer a couple of very impressive advantages in comparison to non-highlighted children’s beds models. First of all, car beds with headlights look more stylish and memorable, which is an undeniable plus. Next, unobtrusive LED lights can serve as a kind of nightstand, which is another useful addition to a kid’s room. Still, before you start looking for suitable models, make a note of the following guidelines — they will prove quite useful in the shopping process. First of all, choose your lighting shade. LED lights come in many different colors, and even though white and blue are the most popular ones, it is possible to find something a bit more contrasting, or more suitable for your kid’s room color palette. Yet, the most important thing you will have to weigh over before you hit the stores is the bed model you are looking for. There are racing cars and sports cars, trucks and buses, vintage cars and modern cars, cars that look real and cars designed like toys. In other words, choose at least approximately what you will be looking for. Next, do not forget that car beds are generally a bit more space consuming than standard beds. So, if you have set your mind on a car bed, you will have to carefully consider maximum dimensions you should be going for. Also, you might have to rearrange your current furniture layout a bit. If you are going to buy more than just one bed, look for the matching items in the process — think over possible designs, bookmark the models that fit, and so on. Also, note that sometimes different stores feature surprisingly different prices on almost identical models and do not rush to buy the first car bed you see. At least take some time to check out a couple of stores and stick to big reputable platforms. Make sure to look for beds with durable frame construction and quality body materials. Even though such models might cost a bit higher than average, high quality is always more important than the low price. A lot of quality car beds with headlights can be found at Furniture in Fashion online store. This leading UK platform offers only quality solutions at reasonable cost. Even though this is a general store that does not focus on children’s furniture exclusively, it still has a couple of stylish suggestions to offer. Yet, one of the biggest benefits of shopping with this company is that it can guarantee quick delivery to any part of the UK and is ready to welcome visitors in company showroom in Farnworth.